Continuing on from my thoughts in Yield Management in Hostels?, in this article I present a simplified example of how a Hostel might use simple Yield Management principles to increase its profitability. Yield Management or Revenue Management or Revenue Optimization is a set of theories and practices that help companies, typically in the transportation and hospitality industry, gain the most revenue possible by selling a limited product where short-term costs are, for the most part, fixed. Simply put, this is why the prices of plane tickets change every time you check and why you can save on hotel rooms by booking in advance. Consider a simplified hostel. Another time I will discuss some of these simplifications. This hostel takes only single-person bookings for a maximum of a 1-day stay. 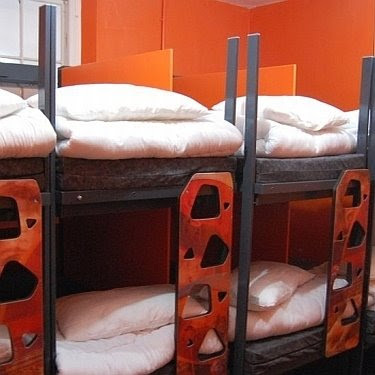 This hostel has the following rooms: 6 private single rooms and one 6 person dorm. The beds in the single rooms go for £20 and beds in the dorm go for £10. The hostel has entirely fixed costs, meaning they would rather fill a bed at 1p than have it be empty. Our simplified hostel realizes demand in two streams. The cheapskate travelers desire the cheap dorm rooms, and the wealtheir backpackers are willing to splurge on a single room. The cheapskates would choose the single rooms if they were the same price, and this is the key to my example. I've colour coded the scenarios above so we can see when we would benefit from upgrading a guest, when we would suffer, and when we are indifferent. In the first two scenarios we receive enough single room booking requests that we could have filled our single rooms at £20, and thus putting a cheapskate in there for £10 hurts our total revenue. In the third scenario we do not receive enough booking requests to have to turn anyone away, so we are indifferent between the upgrade and not. Finally, in the last scenario, if we offer an upgrade, a cheapskate sleeps in as single room for £10 that would otherwise have gone empty and the dorm remains full. Evaluating the decisions is then a matter of estimating the likelihood of each scenario and calculating the expected revenue for each choice. We evaluate the decision in the same way you would evaluate the following game: I flip a fair coin. If it lands heads I give you £2 and if it lands tails you give me £1. Naturally you would calculate that 0.5*£2 - 0.5*£1 = £0.50 and thus the game is worth playing. The expected value of the decision to play is £0.50. In order to carry this example through, suppose the probability of there being 5 or more single booking requests is 20% and 4 or fewer is 80%. Suppose the probability that 1 or more dorm booking requests is 75% and 0 is 25%. All probabilities are independent. As we can see, in the example that I have just constructed, we can expect to make £3.50 by giving a guest an upgrade in the same manner that we expect to gain £0.50 by playing the coin tossing game. Now £3.50 may not sound like a lot, but scale this up to a multi-hundred bed hostel and we're talking about more money. What made this a winning decision? The £10 we might gain by replacing our upgradee with another guest in the dorms outweighs the £20 we might lose if we have to turn someone away from the single rooms. Small Dorms (9 person and below) 135/276 booked. *data gleaned from Hostelworld.com, reliability uncertain. Based on your gut feeling, what are the odds that they could realize an expected benefit from upgrading some of their large dorm guests to small dorms? 10 guests? 20 guests? If the large dorm beds were filled this could represent £100-£300 in additional revenue. Minus the marginal costs of the guest including their free breakfast of course. Food for thought. Later I would like to generalize this simple scenario, discuss the simplifications, assumptions, limitations and extensions. That's all for now, though. The way I've set this up might seem strange. Why go to the trouble of upgrading someone from the dorm when you could simply sell a single room as a dorm room? This is because I'm already looking forward to implementation. I don't anticipate hostel management IT systems to have the ability to do this. Instead I envision hostel management IT systems linking bed inventory directly to what is offered online, and thus for us to offer beds at the dorm rate, there must be beds available in the dorms on our system. Additionally, rather than being handled directly by the IT systems, I envision a clerk/manager manually intervening in the system and upgrading a booking. This person might follow a simple set of decision rules compiled from analysis of past data in order to make their decisions. If this strategy proved to be profitable, then it's integration into IT systems might occur. In my recent travels in Europe I have again had significant exposure to the Hosteling Industry. As readers of this blog will know, we can't help but seeing Operations Research or opportunities in our daily lives. Sure enough we find ourselves analyzing our surroundings and considering the pricing structures of our hostels. In this article I hope to begin an exploration of pricing strategies in the hostel industry that I will continue after I have collected some of your thoughts and more of my own. The Hostel industry has been rapidly developing throughout the world. According to Wikipedia, youth hostels had their humble origins in German Jugendherberge (1912), non-profit hostels for youths by youths. Fast forward to today and you can witness the evolution to profit-maximizing corporate hostels sometimes exceeding 500 beds. That said, sophistication in the industry seems to be developing more slowly. In particular, possibly due to it's origins, there is significant resistance to profit-maximizing activity like yield management. I also believe that there is a growing suite of hostel management IT systems with some direct interfacing with booking websites. I can't claim to be an inside expert in the industry, though we did have a nice informal chat with the manager of a small-to-medium-sized non-profit hostel over beers in Munich. Youth hostels face a problem that is similar in some ways, but different in others to that faced by traditional hotels. Apart from the obvious similarity of product, the primary similarity is that both face an expiring good that is booked ahead of time and cannot be stored. Hostels, however, do not have business customers. Traditional revenue optimization approaches for hotels centre around price discrimination. With leisure customers and business customers that can be separated by booking time, hotels can sell rooms early at a discount to money-saving leisure customers and sell the remainder later to late-booking, price-insensitive business customers. Hotels can sell some rooms to leisure customers who would otherwise have gone to the competition had they been charged full price, and hotels can then later sell the remaining rooms at a higher price to business customers who would otherwise have only paid the flat rate that leisure customers pay. Hostels on the other hand face an exclusive stream of budget-sensitive travellers. The differentiation achieved by time of booking is thus only a question of how far the customer plans ahead and may say little about their willingness to pay. Hostels have a wider range of product. I'm not an expert in the hospitality industry, so maybe I can ask our readers to confirm this, but I believe your typical hotel offers simply twin, triple, double, queen, and king rooms. The Meininger City Hostel and Hotel in Munich, Germany for example offers 9 distinct products on hostelworld.com: Single Private Ensuite, Twin Private Ensuite, 3 Bed Private Ensuite, 4 Bed Private Ensuite, 5 Bed Private Ensuite, 6 Bed Private Ensuite, 6 Bed Mixed Dorm Ensuite, 6 Bed Female Dorm Ensuite, 14 Bed Mixed Dorm Ensuite. Something that bears noting is that for the most part these products can be ranked such that any customer will unconditionally prefer one over those below it. For the most part, no customer would prefer to sleep in a 14 Bed Mixed Dorm when they could be in a 6 Bed. Other factors relevant to the question of YM in hostels: I estimate that the majority of hostel stays are booked through internet booking websites, with the majority of those coming from hostelworld.com. The majority of these bookings are thus made after some moderate price comparison making the market fairly competitive. Many of these bookings will also be made factoring in reviews of the hostel. Sometimes hundreds of website users will have given the hostel a rating for things like security and cleanliness. The lack of business customers does not mean that hostel customers cannot be segmented. I propose that hostels face two main types of customers. One group comprises the shoestring customers, willing to do anything to save a dollar (or a euro or a pound, etc.). The other group is more differentiating, willing to pay slightly more for a smaller dorm. I'm still working out the significance of this for myself. I believe there is an opportunity there. Some initial research based on my own experience and some creative use of hostelworld shows that hostels often fill from the bottom up. That is that the largest dorms with the cheapest beds are the first to fill up, and the smaller rooms frequently go empty during the week. This may be a sign that the supply of hostel beds does not match demand. This may show that there are more small dorms in the market than desired and fewer large dorms. I welcome any comments on the topic. Is there a business opportunity here, or is it just academic? Is the current state of IT and sophistication in hosteling sufficient to work on elementary yield management? Most hostels have a Friday-Saturday price, and everyone in Munich has a low season, high season, and Oktoberfest price, but could we go further? An interesting talk I attended at the CORS 2008 conference in Quebec City was by Beste Kucukyazici from the Faculty of Management of McGill University. The topic of the talk was “Designing Antithrombotic Therapy for Stroke Prevention in Atrial Fibrillation”. Beste Kucukyazici showed the study of stroke patient data to see if a decision model could be derived to systematically decide on the commencing of warfarin treatment for stroke patient and its intensity. Now my question is: will OR decision models take a bigger and bigger foothold in the future of medical arena as we start to gather more useful patient data in well-planned studies? Medical doctors tend to argue that each patient has a different case, and need to be examined on an individual basis. However, if a model such as Kucukyazici’s can prove the accuracy of its decision given real patient data, then it would probably start to weaken the doctor’s argument and favour a more systematic approach. At least, such models might help reduce the complexity of doctor’s decision making process, or even reduce chances for human errors in diagnosis. Atrial fibrillation, which is a common arrhythmia particularly common among the elderly, is one of the major independent risk factors of stroke. Several randomized control trials have shown that long-term antithrombotic therapy with warfarin significantly reduces the risk of stroke, however, it also increases the risk of suffering a major bleed. Given the potential benefits and risks of warfarin treatment, the decisions that need to be made by the clinicians are two-fold: (i) whether to start the therapy, and (ii) the intensity of warfarin use. The objective of this study is to develop an analytical framework for designing the optimal antithrombotic therapy with a patient-centered approach. The approach seeks to create a rational framework for evaluating these complex medical decisions by incorporation of complex probabilistic data into informed decision making, the identification of factors influencing such decisions and permitting explicit quantitative comparison of the benefits and risks of different therapies. "What is the best time for me to have a child?" Here, "best" refers to a trade off between emotional and physical health problems associated with having a child too late and the impact on career for having a child too early. The answer? Mathematical models come to the rescue. A model developed by Ralph L. Keeney and Dinah A. Vernik from the Faqua School of Business in Duke University attempts to use decision analysis, one of the many operations research techniques out there, to help women decide the optimal time of bearing their first child. In the case of a woman who does not feel that motherhood will be a significant barrier to her pursuit of a particular milestone, the model suggests attempting to conceive a first child at a younger age. Specifically, the model can calculate for any specific situation the level of anticipated negative career impact at which an individual woman may wish to postpone having a child. The example of a 20-year-old college student illustrates the situation when a woman claims she does not want to have a child until she reaches a certain age, say 35 years old. The model suggests that, especially in cases where both family life and career are important to the woman, having a child much earlier may be a better long-term solution than waiting until she is more established in her career.